Even though the Eagles amassed over 500 yards on offense, it was the extra foot that they could not gain on their second to last drive which made all the difference in the game. Add to that another safety gaffe by Nate Allen, who had played better over the last few weeks but was fooled by Cardinals receiver John Brown as he sped past him like a speeding locomotive. Rumor has it that Allen could be heard singing the Geto Boys song “My Minds Playing Tricks on Me” on the way back to the sideline. And what do we make of the quarterback? A position that was one of strength suddenly has become an enigma as we near the halfway point of the season. Along with the quarterback, an offense that was running on all cylinders suddenly turns into the “Jersey Shore” offense when it enters the red zone, as if coming to a screeching halt on Rt. 42 during Friday rush hours in the summer. On Sunday, the Birds entered the red zone (within 20 yards of the end zone) three times on Sunday, only to go without a touchdown. Turnovers also continue to plague this team, as they are -7 in turnover differential after Sunday’s loss, ranking them 29th out of 32 teams, and one of only two to have a winning record with a negative give/take ratio (the Chiefs being the other at -2). But through it all, they have still managed a 5-2 record and remain in the hunt for the NFC East title. How do they do it? By hanging around till the end and somehow managing to pull out the win. This team could easily be 7-0 with two close losses to San Francisco and Arizona, but they could just as easily have been 2-5 if not for close wins against the Colts, Redskins, and Rams, the last in which taking their foot off the pedal almost came back to haunt them. This week, the Birds head to the lone star state to face the Houston Texans and their defensive stud, J.J Watt. The Texans don’t scare anyone with Ryan Fitzpatrick as their quarterback, but Watt should prove to be a handful for the Eagles offensive line. The Texans do have a good coach in former Penn State coach Bill O’Brien, but not enough pieces to do any real damage in the AFC South, which is once again owned by the Indianapolis Colts. Birds win 23-14 and get back on the winning track. Now that the annual bye week has ended, the sight of Birds fans trembling and suffering through withdrawal symptoms due to the lack of an Eagles game this past Sunday should start to subside. And with it, the anticipation of what could become another NFC East title and hopefully at least one playoff victory (or two or three) on the horizon. But while we had to make do without Eagles football last week, there was more than enough exciting NFL action to go around. The Panthers and Bengals continued to flounder, the Packers fans are now “relaxed” (as Aaron Rodgers requested), and the St. Louis Rams defeated the world champion Seahawks with more trickery and antics than either David Copperfield or the Barnum & Bailey circus could ever muster. The Giants came up short in helping us out while Peyton Manning became one of the greatest quarterbacks statistically speaking (though I would still take Tom Brady over him in a big game). While the Eagles are 5-1, their schedule is not very favorable as they have two consecutive tough road games against Arizona and Houston followed by a Monday night at home against Carolina, which then leads into facing the Packers and the Cowboys on the road two of the following three weeks, including a Turkey Day affair with the ‘Boys. Suffice to say, if you have family members who don’t like football and want to discuss your personal life on Thanksgiving while waiting for dessert to be served, this is not the year to invite them over. While the Eagles – Cardinals contest is not a Sunday night affair or the FOX game of the week this Sunday (CBS actually has the doubleheader this week and thus, has the “official” late afternoon game of the week), it is indeed a “marquee” matchup and the 2nd best game on the schedule this week (Chargers – Broncos being #1). The Birds face another 5-1 team which has played surprisingly well since Bruce Arians took over as their coach last year. Hard to believe he was the same guy who coached a woeful Temple team back in the 1980’s when Michael Jackson was creating music video masterpieces and A-Ha was singing “Take on Me” with cool synthesizers playing in the background. Arians has also revived the career of quarterback Carson Palmer, who looked to be done after he was traded to the NFL “over the hill” retirement community known as the Oakland Raiders. The Eagles should have starting linebacker Mychal Kendricks back from injury for this game, and the possibility of Darren Sproles playing would be huge, especially on punt returns. Even so, I think the Birds lose this week on the road, 34-27. But no worries…the season still looks bright. I know my “Top 5” list is bound to create some controversy. For starters, the Eagles are not on the list, while two teams with records of 3-3 are (Seahawks and Chiefs). But both Kansas City and Seattle have played a murderous schedule to date, while the Eagles are 5-1 on a relatively easy schedule. That should change over the next few weeks as the Eagles face some tough opponents, and some quality victories would help to get them more R-E-S-P-E-C-T.
Eagles-Giants games at the Linc usually represent a tight fought, down to the wire contest that is never decided until the final gun sounds. Last Sunday was not one of those games. The Eagles took control from the start, playing their first complete game en route to a 27-0 spanking of the New York Giants. It’s hard to fathom that a team that holds a 5-1 record could not have played a complete game up till now, but such is the case with the Birds, and with the NFL in general. The days of dominating teams leading the league are behind us. The only “hiccup” (if you could call it that) were two Nick Foles interceptions that looked awful from the moment the ball left his hand. After six games, Foles leads the league with seven interceptions, and while no one thought he would match last year’s numbers (27 touchdowns, 2 interceptions), his tendency of throwing INT’s is a cause for concern. In a playoff game in January, two throws like that could doom the Eagles season. But I’ll save that for another time and be positive after a nice Eagles win against a division foe. The Eagles will now enjoy their bye week and take some time to recharge, retreat, and relax, while this Sunday is also a good day for fans to catch up on the usual weekend chores like raking the leaves, cleaning out the garage, trips to Home Depot, etc. In addition, if you (or your significant other) is planning on giving birth any day now, this Sunday is as good as any to do it. At least that way, if the father of your child is yelling “Go! Go! Go!” in the delivery room, you can have the peace of mind of knowing that he’s doing it to give you moral support and not because an Eagles’ player is running into the endzone for a touchdown. Bengals at Colts 1:00 PM EST (CBS) – The Bengals always look like they are on the verge of greatness and then end up falling flat on their face. The Colts have rebounded from an 0-2 start to win four straight and look primed to win the AFC South once again. This will be a good test for the Bengals on the road. Panthers at Packers 1:00 PM (FOX) – The Panthers seem to have lost their stout defense from a year ago and were lucky to get out of Cincinnati with a tie last week. Carolina still leads the NFC South with a record of 3-2-1 (sounds more like a countdown instead of a record) but will be facing the Packers at Lambeau with Aaron Rodgers at the helm at quarterback. The Panthers would be lucky to get another tie this week but don’t bet on it. Chiefs at Chargers 4:05 PM (CBS) – Andy Reid’s teams are practically automatic after their bye week, but they face a tough road test against the Chargers who look to be a real threat to knock off Denver from the top of the AFC West. Even if the Chiefs grab a big lead, Reid will probably not run the ball enough and the Chargers will come back to win it. Giants at Cowboys 4:25 PM (FOX) – For Eagles fans, this game is the equivalent of choosing between two evils, sort of like when Darth Vader faced off against the Emperor in “Return of the Jedi”. The Cowboys are 5-1, which no one expected, so I will be rooting for the Giants in this one (in a painful sort of way). 49ers at Broncos 8:30 PM (NBC) – This game takes the title of marquee matchup “Game of the Week” as the Niners head to the Rockies to face off against the Broncos in a rematch of Super Bowl XXIV (that’s 24 if you don’t recall your roman numerals). In that contest, the Niners throttled the Broncos, 55-10, but not too likely that the same will occur this Sunday. For a while, it looked like I would fulfill my long lost dream of leaving an Eagles game early enough to get home in time to watch the postgame show in its entirety live (as you can see, I have very high aspirations). But with the Birds up 34-7 late in the 3rd quarter, Eagles players must have decided to start making early plans for Sunday dinner, as the Rams rallied off 21 unanswered points to cut their deficit to 34-28 and make a laughable game into a nail-biter literally and figuratively. Along the way, Nick Foles decided to do his best impression of a school kid attempting to do a half-hearted bellyflop on one of those “Slip-N-Slides” from back in the day, as his 4th quarter fumble turned what could have been a game-ending field goal into a turnover and another Rams score. Anthony Gargano from WIP radio (1-6 PM during the weekdays) probably described it best, stating that Foles looked like a “drunken giraffe” trying to slide. What can we make of this team after five games? After three games, the consensus was that they had a powerful offense and an opportunistic defense that made plays when they had to. But over the last two weeks, the offense has been sporadic while the special teams has been just plain AWESOME. But regardless of how they got there, the Birds are 4-1, and as legendary coach Bill Parcells once said “You are what your record says you are”. A record of 4-1 is not too shabby considering all the injuries this team has sustained and the inconsistent play from the quarterback spot. This week, the Birds play host to the Giants on Sunday night football in a game that will indeed be a “marquee matchup” for Week 6. The Giants started the season 0-2 and were playing more like ants, but over the last three weeks have built a three game winning streak in which their offense has really come to life. Eli Manning has dropped his “She-li” persona and has been on a hot streak which is never a good sign for the opponent. A win would make the Eagles 5-1 and in great shape heading into their bye week while a loss would leave the Giants tied with the Birds and possibly give Dallas sole possession of first place based on the outcome of the Cowboys-Seahawks game, which will take place on Sunday afternoon. It’s tough to predict this game and figure out which Eagles team will show up, but the games at home against the G-Men always seem to go down to the wire. The Linc will be loud and in a “blackout” (as the Eagles have requested from an attire standpoint) as the Birds win 34-28 in another nail-biter. R.I.P. Bill Campbell. Mr .Campbell, at some point in his life, did play-by-play for the Philadelphia Warriors (basketball), the Sixers, the Phillies and the Eagles. His voice was a mainstay of the previous generation and with his passing, he joins others such as John Facenda, Harry Kalas, Richie Ashburn and Gene Hart in the halls of Philadelphia broadcasting icons who have left us. The fact that the Eagles lost to the 49ers, 26-21, wasn’t a shock at all. But it was HOW they lost that had many perplexed. If you had told any football fan that the Birds would need only one offensive touchdown to defeat San Francisco, 99.9% would have bet the farm that the Eagles would win, with the only exception being some guy living in a foxhole somewhere in Montana who didn’t have time to place a bet if only for the fact that law enforcement was on his tail. But the Eagles high powered offense, which was running up and down the field at the rate of Speedy Gonzalez over the first three games of the season, suddenly looked more like the “Slowsky’s” from the Comcast commercial. LeSean McCoy was unable to find any running lanes due to his inexperienced offensive line and was often too quick to try to run outside instead of trying to pound his way up the middle. Meanwhile, quarterback Nick Foles had receivers open, especially in the first half, but kept overthrowing them on passes which would have led to big gains. The Birds would have been blown out of Sunday’s contest quite early, but managed to stay in the game due to the rare trifecta consisting of 1) An interception, 2) A punt return, and 3) A blocked punt, all of which led to three touchdowns and had the Eagles two yards away from taking the lead and possibly stealing a game that they really did not deserve to win. 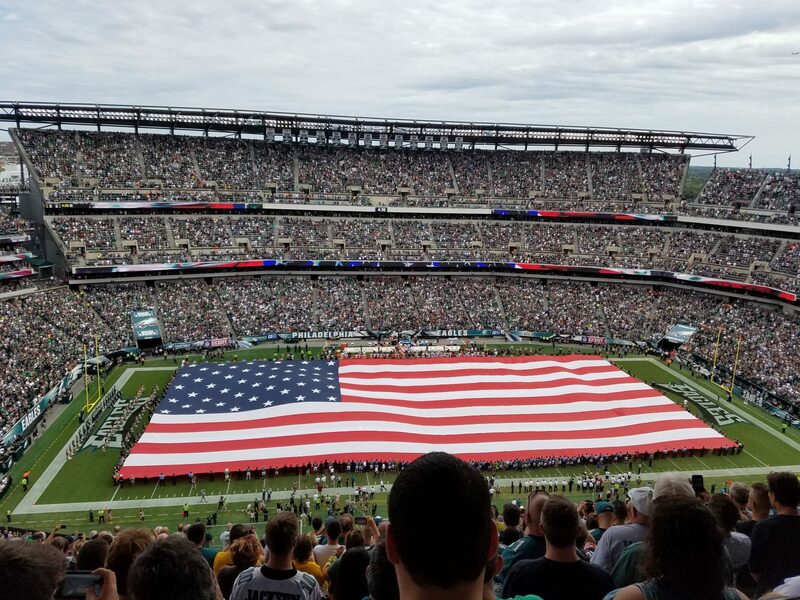 But while their ineptitude at the goal line reared its ugly head at the most inopportune time, the team still sits in good shape at 3-1 on the young season, and the return of Lane Johnson from suspension should help to stabilize an injured and revolving offensive line, and perhaps help the running game to get back on track as well. It also doesn’t hurt that the Eagles will be facing the St. Louis Rams, who won’t be confused with the “Greatest Show on Turf”, which is what they were when Kurt Warner made the transition from throwing chickens across the poultry aisle to throwing touchdowns to Isaac Bruce and Torry Holt. The 2014 edition of the Rams will be lucky to finish 8-8, and the Eagles would do well to score early and often and not give the Rams any reason to think they can win. No fear peeps – Eagles win 31-20, and get back on the winning track. The Phillies just ended their 2014 campaign, and while the company line is that they did not lose any more games than last year (73-89 in consecutive years), this year was actually worse, if only for the fact that they were out of playoff contention by July 1st instead of August 1st. The team has an aging roster and under the helm of team president David Montgomery, refused to try to get younger and better, sticking with scouts who’ve made bad draft choices and players who just can’t play at the big league level. With Pat Gillick serving as the team’s temporary president, things should start to improve, as Gillick won’t hesitate to revamp the farm system. Gillick, in my opinion, is the main reason the Phillies won it all in 2008, and while not every baseball move he made was the correct one, the man has made many more good than bad decisions, resulting in his many years of success with so many different organizations. Come to see the Phanatic, we’ll stink!